Select oranges that are heavy for their size, this indicates a juicy fruit. Do not select an orange with the stem still attached, ripe oranges come off the tree easily and should not have a stem still attached. A ripe orange will have a skin that is vibrant orange and will have a tender texture, when squeezed gently it should have a give to it. Unlike other fruit wrinkles on the skin of an orange also indicate a ripe orange. Oranges can be stored in the refrigerator for up to two weeks. Wash and peel the oranges dividing them into sections and removing all the membranes and seeds. In a pan mix 2 ¾ cups of sugar with 4 cups of water stirring the solution constantly until the sugar dissolves and bringing the mixture to a boil. Allow the syrup to cool and then pour it over the orange slices. Place the oranges along with the syrup in an airtight freezer container and store in the freezer. 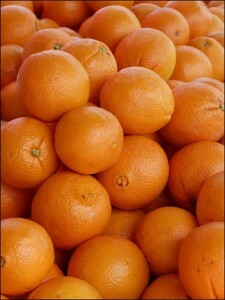 Oranges do not ripen after they have been harvested from the tree, however, it is still possible to ripen the peel by exposing the fruit to ethylene. To ripen the peel simply place the orange in a brown paper bag with an apple or banana and fold the top closed. Check the bag daily to inspect the condition. To ripen an orange immediately you can place it in a microwave safe dish and heat it in the microwave for 15 seconds at medium-high heat. The peel will change but sweetness of the fruit will not be increased through these processes.